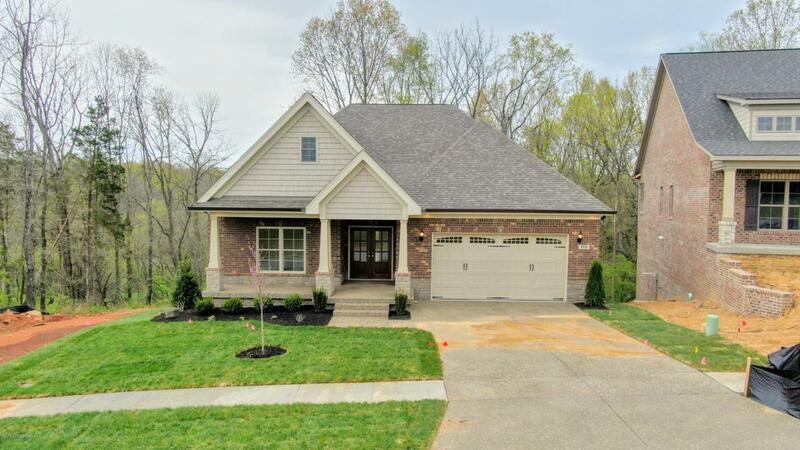 Construction is underway on this gorgeous ranch in one of Louisville's newest developments, the Park at Locust Creek. This luxury neighborhood is nestled in an incredible parklike setting yet still offers immediate access to the restaurants, businesses and expressways of the Shelbyville corridor. The appeal and convenience of this stunning home only continues with groundskeeping, lawn maintenance and upkeep available in a monthly maintenance fee, leaving homeowners more time to enjoy their beautiful home. Custom-built by Jeda Homes, expect the very best with top-of-the-line finishes to include stylish cabinetry and countertops, intricate ceiling details, and beautiful hardwood flooring. The open floor plan features a great room with vaulted ceiling and fireplace, gourmet eat-in kitchenwith breakfast room, and large master suite offering master bedroom with vaulted tray ceiling and beautiful views of the wooded lot, as well as a master bath with soaking tub, dual vanities and spacious walk-in closet. Two bedrooms with Jack-and-Jill bath, a covered deck with vaulted ceiling, laundry room, half bath and attached two-car garage complete the first floor. The unfinished walk-out lower level includes a second covered deck as well as nearly 2,000 square feet to transform into additional living space.